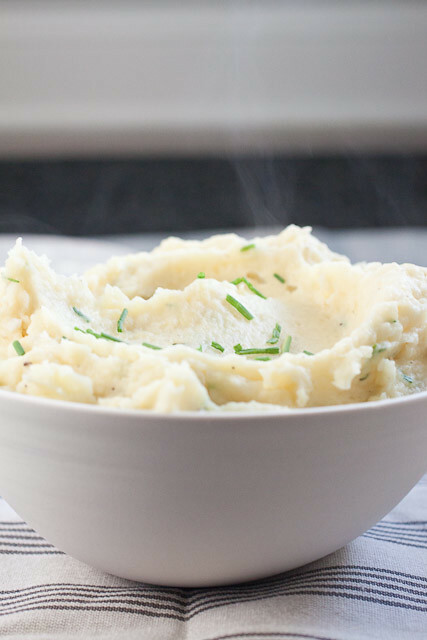 These creamy fresh herb mashed potatoes are a fancy way to boost your mashed potatoes game and use up those annoying leftover fresh herbs in your crisper drawer. I don’t know about you guys but I count sweet potatoes at Thanksgiving as a vegetable instead of a carb. This strategy, however skewed, leaves extra room on the carb-overload list for favorites like stuffing, rolls, pie, and yes, mashed potatoes. And up until a few years ago, I really wasn’t all that picky about how mashed potatoes were made. And really, I’m still not all that picky. There is a time and place for rustic smashed skin-on potatoes – and this is the way we usually make them since I mostly don’t have the time nor patience to peel potatoes. 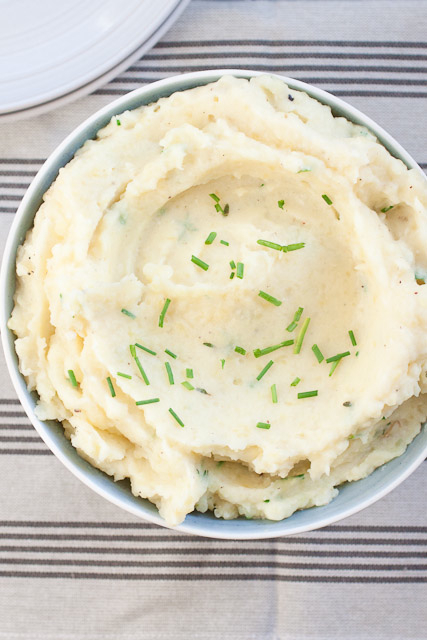 But these silky and creamy fresh herb mashed potatoes definitely have their place in this world too, peeled and all. They probably aren’t too different from the way most people make mashed potatoes except that these are passed through a food mill rather than hand-mashed to ensure a light and fluffy result. Then some hot milk and butter are mixed in and the potatoes are dotted with fresh thyme and chives. The herbs are subtle yet bright and honestly, I preferred to skip the gravy this time so that I could actually taste the potatoes and herbs. I shock myself sometimes. Bring on the holidays and bring on the carbs! A food mill is a great tool to use for these mashed potatoes and if you only use it once or twice a year for these potatoes, it will be worth the cost. Alternatively, you could use a ricer but I don’t recommend a potato masher unless you’re ok with smashed or lumpy potatoes. Most of the time, I’m fine with lumpy potatoes but a potato masher won’t give you silky smooth potatoes. Dice the potatoes into ½-inch pieces. Toss the potatoes into a medium (3 quart) saucepan and cover them with cold water – the water should reach about 1-inch above the tops potatoes – and add 1 teaspoon of salt. Cover and bring the water to a boil over high heat. Reduce to a simmer and keep the pan partially covered. Simmer the potatoes for 12-15 minutes until they are fork tender. Drain and cover the potatoes in the colander with a kitchen towel. Return the saucepan to the stove and heat it over medium heat to dry it out. Add the milk, butter, garlic clove, remaining salt, and pepper. Once the milk starts to steam and the butter is melted, remove the garlic clove (discard the garlic) and turn the heat down to low. Place a food mill (or potato ricer) over the saucepan and pass the hot potatoes through the mill into the milk mixture. Once all of the potatoes are passed through (don’t forget to scrape the bottom of the mill! ), add the herbs to the pan and stir the potatoes and herbs into the hot milk mixture until the milk is absorbed and the potatoes are smooth and creamy. Season with additional salt and pepper, if needed. Mmmmm such delicious and perfect potatoes!!!! These really look like the perfect mashed potatoes! Creamy, dreamy and absolutely delicious. Thanks, Georgia! They really are totally delicious! Stuff I’ve Gotta Share and You’ve Gotta See | Weight Loss & Wellbeing.